Members of the Downtown Boulder Partnership are informed, connected and represented within the community. See our current member list. Join now for Membership for the 2019 Calendar year (January - December). Enhanced Listing on BoulderDowntown.com. Our website sees over 150,000 page views per month and is the #1 source of information for visitors to downtown. You'll be top of mind and easy to find with a business profile page and the ability to feature multiple photos. Members can easily update their page any time via the exclusive member portal. Members Only Portal. You'll have access to the Members Only section of our website where you can view an online directory with addresses and contact information for our 400+ members. Here you can update your listing, manage your membership, download reports, and submit events to our website calendar. DBP Member mailing labels are also available upon request. Monthly Members-Only Newsletter. Stay up-to-date on downtown happenings, business-to-business discounts, networking events, sales tax figures, openings/closings, and ways to participate. Members may submit M2M offers and announcements to share. A unified voice on downtown issues. DBP is the voice of downtown working with City Council, City Staff, Boulder PD and others to represent the business community. We’ll keep you informed on all of our efforts to keep downtown safe, accessible and vibrant. Sponsorship Opportunities. With over 19 signature events, DBP attracts more than 250,000 people downtown each year. Members are eligible for sponsorship opportunities ranging from booths to title sponsor recognition. We’ll work with you to find the right audience to fit your marketing needs. Member Events. DBP also hosts networking and educational events throughout the year with free or discounted registration for members. Mark your calendars for our Annual Awards Luncheon, Social Media Breakfast, Employee Appreciation Day, Holiday Party, and more. Promotional collaborations. As members, you benefit from cooperative campaigns such as Sidewalk Sales, Foodie Fridays, Employee Appreciation Day Discounts, Small Business Week, Love the Local, Ugly Sweater Day contests, and the Downtown Boulder Guide Book. Showing your support for the community you love! As proud members of the Partnership, you further our mission to make Boulder a vibrant place to shop, dine, work, live and play. 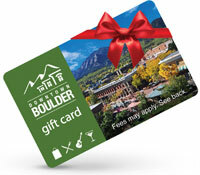 An additional benefit to our business and nonprofit members is the ability to accept the Downtown Boulder Gift Card. The card is sold online and in-person through the Downtown Boulder Partnership. With over $400,000 redeemed annually at nearly 200 participating businesses, participation in this program provides members another great way to reach downtown consumers. Listing on the gift card merchants list, which goes out with every card sold and on our website. Inclusion in unique gift card marketing campaigns. Resources and tools for in-store marketing, including a "Gift Cards Accepted Here" window decal. You don’t have to own a business to be a downtown partner! Join at the Individual level to stay informed and engaged with our downtown community. Benefits include access to our member portal, members-only newsletter, member events and a voice on downtown policies and issues. Our All-Star Member program recognizes businesses for going above and beyond! Read more.